My husband and I have a tendency to get sucked into tv shows, especially when we jump on the bandwagon a little late and have the benefit of being able to marathon our way through previous seasons. Long ago, in our young, child-free lives, we found ourselves sucked into The Sopranos. This was way back in the day when people rented movies from places like Blockbuster. Netflix was still in its infancy, Redbox didn’t exist at all, and cable on-demand options were limited. But, there was good ol’ Blockbuster…reliable as long as you managed to snag the video you wanted, before someone else did. My husband and I picked up The Sopranos a few seasons into its run. And we got hooked. We’d stay up way too late, drinking way too much beer, and then find ourselves walking to Blockbuster at 11:30pm (or running if we were minutes before closing) to get the next disc…for just one more episode. It was a rough adjustment once we’d caught up and had to wait week to week for new episodes and months or even years between seasons. But, that excitement of getting caught up in a show is so much fun. Most recently, Battleship Galactica did it again for us…this time on Netflix streaming, which saved us those midnight runs to the video store. The show hooked us in the same way as The Sopranos, maybe even more so. We never would have predicted that a sci-fi show (not our typical genre) would have had us watching the clock until the time we could put the kiddies to bed so we could fire up another episode. One more, just one more…and then we’ll go to bed, for serious. It was a sad day when we watched that last episode, knowing the show had long since ended its run. I still miss you, Commander Adama. Begin introducing myself as Lady Amy of Syracuse. Install service bells in all rooms of the house. Use the word “indeed” more often. Take more naps and drink more tea. Spend more time trying to figure out who my sons will marry. 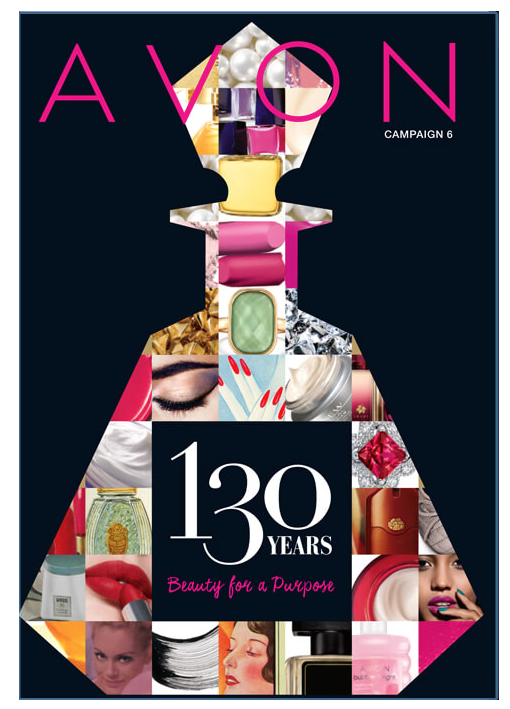 Purchase a collection of cufflinks for my husband. Build a room to sit in while I wait for the cooks to finish making my daily feast. Clearly, I’m going to be very busy. It’s no wonder those ladies need to take so many naps. In the mean time, I’m going to continue wearing my sweatpants, responding to Mommy (or maybe Lady Mommy), and cooking my own meals. I am crazy about chicken salad. It’s always such an easy, satisfying meal (especially on those nights when you wish you were just sitting around waiting for someone to cook your dinner). When I don’t know what to make for dinner, I make chicken salad. There are so many possible ways to make it and I love them all…just as long as they’re not too mayonnaisey. But mix the chicken with different spices, fruits, nuts, or veggies and it’s hard to go wrong. 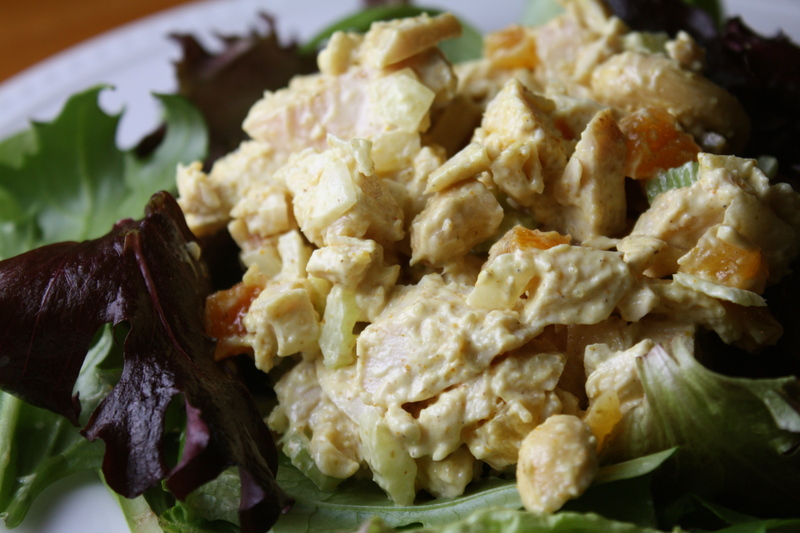 One of my recent favorites is this curried chicken salad with bits of dried apricots and crunchy cashews. Serve it over a bed of mixed greens or on your favorite bread. Stuffed inside a slightly warmed pita round would be heavenly, indeed. Combine mayonnaise, mustard, and curry powder. Stir in the chicken, apricots, cashews, celery, onion. Season with salt and cayenne pepper, as desired. 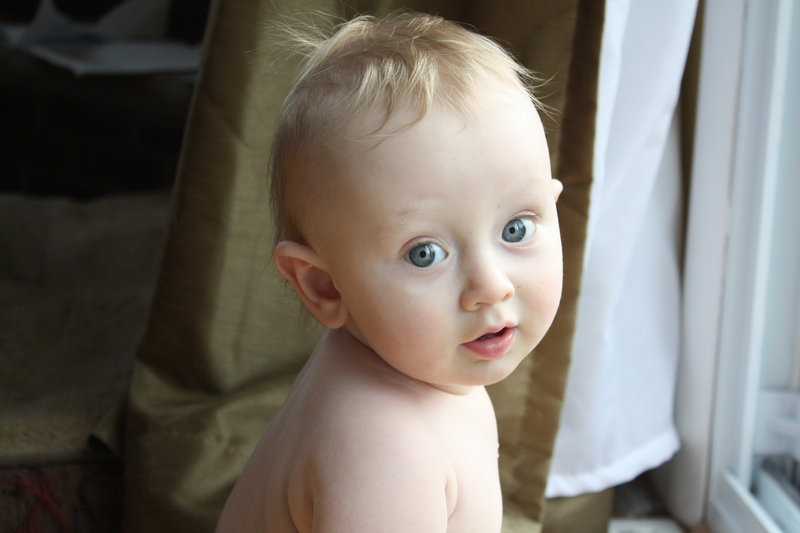 In other news, this little man has started taking his first, wobbly steps. I think I’m going to have my hands full for a while. 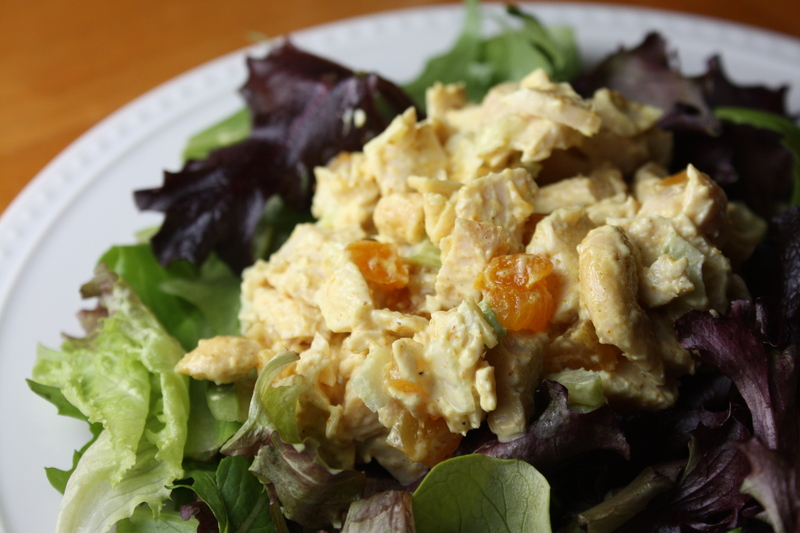 Might be just the time to make a big batch of this easy, delicious chicken salad! Posted in Food, Fruit, Main Course, Poultry, Recipes, Salads, Sandwiches, Side Dishes and tagged babies, battlestar galactica, chicken, comfort food, Cooking, downton abbey, Food, kids, life, parenting, Recipes, salad, sandwich, sopranos, south beach diet, tv. Bookmark the permalink. The recipe sounds so yummy! I can imagine that apricots and cashews taste great with chicken. Just what I’m looking for the luncheon Now I know my luncheon will be a success.